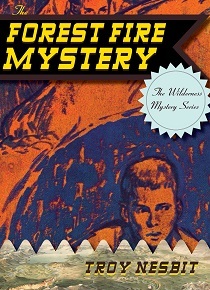 Originally published in 1962, the Forest Fire Mystery is a fast-paced story that tells the story of 15-year-old Art Mills, who moves with his parents and younger sister from Denver, Colorado, to a small southern Colorado town bordered by a national forest. Art gets off to a rough start with the local boys, who trick him into hunting for an animal they tell him is called a snipe. While searching for it, Art discovers Fittelson’s Folly, an abandoned mine. He notices one man spying on another man who marks a nearby rock face with crayon. Curious about this, Art returns to the mine and finds pieces of perlite, a valuable rock, and puts a sample of it in the window of his parents’ diner. Soon, mysterious fires start on the mountain, and Art suspects that one two men he saw near the mine is starting them. One man is a prospector and the other runs a timber company. When Art’s sample of perlite disappears from the store window, he replaces it. After it vanishes again, he starts to suspect one of the men of the theft. Art longs to solve both mysteries and asks an older boy to join him in spying on one of the men, who threatens Art when he discovers them following him. Art and his friend deduce who the arsonist is and how he started the fires. According to the back cover of the book, Troy Nesbit was a pseudonym for Franklin Folsom, who wrote more than 80 books, including the Wilderness Mystery Series, a seven-part series that includes the Forest Fire Mystery. While Folsom’s concern about the environment comes through as a theme of this book, the dialogue is somewhat dated but should be enjoyable for children who enjoy the books similar to the Boxcar Children mysteries or reading about stories that take place in wilderness settings. The publisher sent a copy of the book for review.